There is a room at the left of the entrance to the Art Palace marked "No. 1 — keep out." To this the speakers at the Congress of Religions all repair sooner or later, either to talk with one another or with President Bonney, whose private office is in one corner of the apartment. The folding doors are jealously guarded from the general public, usually standing far enough apart to allow peeping in. Only delegates are supposed to penetrate the sacred precincts, but it is not impossible to obtain an "open sesame", and thus to enjoy a brief opportunity of closer relations with the distinguished guests than the platform in the Hall of Columbus affords. The most striking figure one meets in this anteroom is Swami Vivekananda, the Brahmin monk. He is a large, well-built man, with the superb carriage of the Hindustanis, his face clean shaven, squarely moulded regular features, white teeth, and with well-chiselled lips that are usually parted in a benevolent smile while he is conversing. His finely poised head is crowned with either a lemon colored or a red turban, and his cassock (not the technical name for this garment), belted in at the waist and falling below the knees, alternates in a bright orange and rich crimson. He speaks excellent English and replied readily to any questions asked in sincerity. Along with his simplicity of manner there is a touch of personal reserve when speaking to ladies, which suggests his chosen vocation. When questioned about the laws of his order, he has said, "I can do as I please, I am independent. Sometimes I live in the Himalaya Mountains, and sometimes in the streets of cities. I never know where I will get my next meal, I never keep money with me I come here by subscription." Then looking round at one or two of his fellow-countrymen who chanced to be standing near he added, "They will take care of me," giving the inference that his board bill in Chicago is attended to by others. When asked if he was wearing his usual monk's costume, he said, "This is a good dress; when I am home I am in rags, and I go barefooted. Do I believe in caste? Caste is a social custom; religion has nothing to do with it; all castes will associate with me." 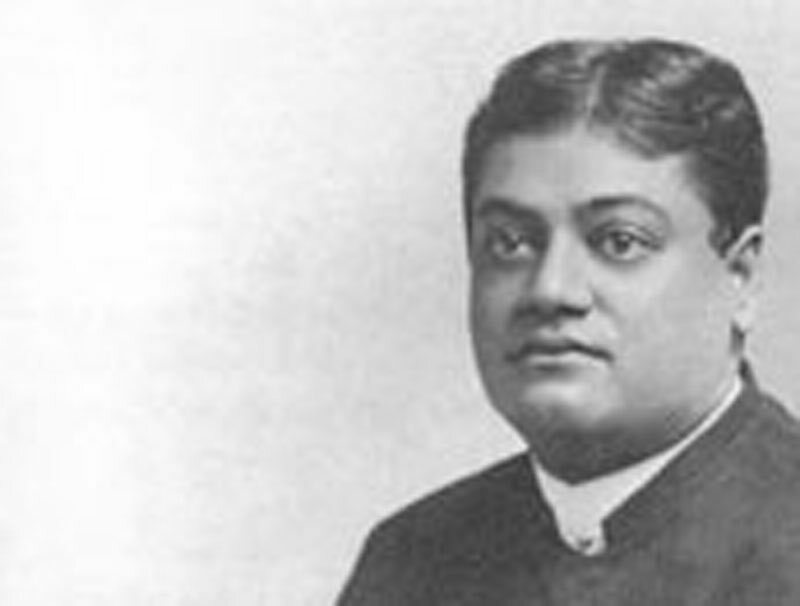 It is quite apparent, however, from the deportment, the general appearance of Mr. Vivekananda that he was born among high castes — years of voluntary poverty and homeless wanderings have not robbed him of his birth­right of gentleman; even his family name is unknown; he took that of Vivekananda in embracing a religious career, and "Swami" is merely the title of reverend accorded to him. He cannot be far along in the thirties, and looks as if made for this life and its fruition, as well as for meditation on the life beyond. One cannot help wondering what could have been the turning point with him. "Why should I marry," was his abrupt response to a comment on all he had renounced in becoming a monk, "when I see in every woman only the divine Mother? Why do I make all these sacrifices? To emancipate myself from earthly ties and attachments so that there will be no re-birth for me. When I die I want to become at once absorbed in the divine, one with God. I would be a Buddha." Vivekananda does not mean by this that he is a Buddhist. No name or sect can rebel him. He is an outcome of the higher Brahminism, a product of the Hindu spirit, which is vast, dreamy, self-extinguishing, a Sanyasi or holy man. He has some pamphlets that he distributes, relating to his master, Paramhansa Ramakrishna, a Hindu devotee, who so impressed his hearers and pupils that many of them became ascetics after his death. Mozoomdar also looked upon this saint as his master, but Mozoomdar works for holiness in the world, in it but not of it, as Jesus taught. Vivekananda's address before the parliament was broad as the heavens above us, embracing the best in all religions, as the ultimate universal religion — charity to all mankind, good works for the love of God, not for fear of punishment or hope of reward. He is a great favorite at the parliament, from the grandeur of his sentiments and his appearance as well. If he merely crosses the platform he is applauded, and this marked approval of thousands he accepts in a childlike spirit of gratification, without a trace of conceit. It must be a strange experience too for this humble young Brahmin monk, this sudden transition from poverty and self-effacement to affluence and aggrandizement. When asked if he knew anything of those brothers in the Himalayas so firmly believed in by the Theosophists, he answered with the simple statement, "I have never met one of them," as much as to imply, "There may be such persons, but though I am at home in the Himalayas, I have yet to come across them."